Today is another EMS Week story. 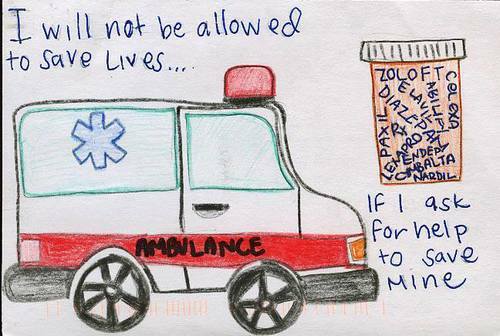 This one written by an anonymous former EMS provider. It’s dark but it provides some insight into how hard of a job EMS is. God had a plan for these people and we weren’t going to let God’s plan stop us from saving that person’s life be they a young child or an elderly person. We always tried a little harder to save the young child because they had their whole life to live, but we fought tooth and nail to save everyone. We won some, we lost some. The more we lost, the less feeling or cares I had. It’s just like the beginning of Ghost Rider, you sell your soul to the devil to save that person’s life. It wasn’t that instant that the devil came for my soul, but it was a slow process that took my humanity with every call we had. I started out in a small private EMS service so the change was slow and not as noticeable. Most of the calls we handled were either transports or true emergencies. 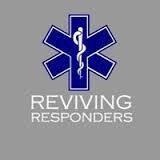 I worked there for about 5 years and enjoyed EMS. Then the service closed. As soon as I found out, I went straight to the next closest ambulance service and applied. Shortly after, I was hired. This service was the primary ambulance service for the county I worked in. They handled all calls and transports. I always enjoyed the transports the most as they were people who needed our services to get to and from their doctors or dialysis treatments. Some were a pleasure to talk to and you could hear a great story from World War 2 or some other war they may have served in. It was a nice change from the daily grind of hurry up to get to calls and help people. Some we saved, some we didn’t. The creeping in happened more and more. I never noticed it, but the people in my life outside of EMS did, and they suffered. I was only part time, but I was slowly losing my soul. As the ALS calls increased, so did the runs. Some of these Pt’s could talk, some couldn’t. Most truly needed an ambulance, some didn’t. The ones that didn’t got to me. These people were the ones who were taking advantage of the system. Calls at 3 AM for tooth pain or some other complaint just to go to the hospital to feed their drug addiction. As the “BS” calls increased, so did the disdain for human beings, sure I had my friends I liked, but the people who were calling and abusing the EMS System were getting to me. It was no longer good enough to help the people that truly needed the ambulance. The young child we had just saved didn’t give me a sense of accomplishment or a good job done. Some you saved you felt bad for as you knew the quality of life they would have being on a ventilator for the rest of their long, long lives. They joy you saw on the parents faces when you tell them their newborn is still alive, only to know the heartbreak they would probably have seeing their child attached to machines to live for as long as they live. Never getting to watch them walk down the aisle at their Senior Prom, not getting to walk them across the field for Senior Night at the Friday night football game. The knowledge that they we probably have to bury their child. The more I ran, the less I cared. I should have known something was wrong when a dead bodies stopped bothering me. I was not the same person I was when I started in EMS or for that matter, the same person as when I met my wife. She warned me I was changing, but instead of listening, I pushed her, our life, or family to the side and worked more and said she was full of it. The feeling I had for the “BS” calls turned from upset to hatred. I would routinely tell patients that they were wasting our time when someone else my truly need an Ambulance to save their life. Was I wrong? No, but why did the person with a drug issue deserve any less care than person with chest pain. They are both human, both have issues. Why was it OK to treat one like crap and the other with care during their time of need? Sure, one needed help and the other just wanted a free fix, but they were both still human. I should have treated them with more respect as I had once dealt with my own demons. When my son’s mother and I separated I treated my anxiety of losing my son and paying child support with drugs and alcohol. Sure, I didn’t abuse the EMS system like they are, but was I really as bad as them? We were no different, battling demons that I was lucky enough to beat. They had just not reached the point to be able to beat them. We were very similar, but I still hated them. The creeping turned to running. No longer did I have feelings for most people. The only person I had any feelings for was my son and at this point he was nearly 300 miles away. I was unhappy in everything I did, and that gave me enjoyment. The DOA a 6 AM didn’t give me feelings of sadness anymore, I almost enjoyed it. Someone else was in pain and I thrived for it. As sick as it makes me to think about it now, it almost gave me joy. I’m standing in someone’s house whom had just lost a loved one, be it husband, wife, father, mother or child and here I am, trying not to smile. The running finally stopped as my soul was finally taken. I talked to no one about it and that was my first mistake. I had no cares, no feelings, and by this point, my goal was to make everyone as miserable as possible. Then it happened..
My uncle suddenly passed away from an MI. Totally unexpected. I wasn’t very close to him but I respected him because he was a hard worker. He worked for his local jail, owned a farm, helped my cousins raise cows for 4H, plus was a loving husband and father. How he managed it all I’ll never know, but I respected him for it. As I sat in the funeral home, I started to have feelings and get emotional. I cried. I tried to hide it as I’m not someone who cries. I’ve seen dozens upon dozens of dead bodies and never once shed a tear. Sitting next to my father, a man whom also never cries, getting tears in his eyes, I couldn’t help but cry. In my 30 some years on this earth, I had never seen my dad cry. Back to daily life and my feeling were gone. Hating patients, co-workers, even family. My wife and step kids bore the brunt of my hatred. I was a miserable person to be around. They couldn’t stand me; I couldn’t stand them. My wife, seeing my decline tried to help, but I would have nothing of it. I was fine, I didn’t need help. She was the “nagging” person. Why couldn’t she just leave me alone and deal with it. Feeling have no place in life and I was happy being miserable. For some reason, she dealt with ever snide and hateful comment I gave her. Just little jabs here and there but they add up quickly. She tried to help, told me how horrible I was and that I needed help. I had made it to the point in life where I was no better, maybe even worse than the person that I would scold for abusing the system. No, I wasn’t abusing the EMS system, I was mentally abusing my wife, and she took it. My wife was trying to juggle being a wife, mother, housekeeper, full time employee, and full time student, yet she still had time to try and show me how far I had fallen. I wanted nothing to do with her “feelings” or trying to help me, I was fine. Guess we can add full time punching bag to the things she did. Never once did she give up on me. I was at the point in life where I cared about nothing, comments to piss people off came naturally and enjoyable. My wife, no matter how much she loved me, couldn’t take it anymore, as well as she shouldn’t have. The comments not only hurt others, but hurt me. I was suspended from work for a joking comment I made. I was investigated and nearly lost my job. I still didn’t want help as I felt I was still fine, nothing wrong with me, it’s the world, not me. I entered my employers EAP program. I didn’t want help, I wanted to save my job. I went to the sessions, learned some things and was made to realize that not all comments should be said. I began watching what I said, but I didn’t change. I still hated everything and everyone. I wasn’t the one with problems, the world was. I continued on working nearly full time and both my main job as well as on the Ambulance. My hatred continued to grow with every patient I saw. It didn’t matter if they needed help or not, I hated them. Then came the breaking point. My hatred of everything became an affair. I cheated on my wife. She found out. The only person who tried to help me no matter how much I verbally abused her had just had her life torn from her in a truly horrific way. I ended up living out of my car for several weeks. It’s a very humbling experience. I spent a lot of time down by the river just thinking about my life, what I had done with it, what I hadn’t done as well as the mistakes I made and the things I did right. The river was a very peaceful place and gave me the time I needed to get myself together. I began to realize just how far I had fallen, the horrible things I had done, and just how heartless and uncaring I had become. My soul began to return. Just like in the movie I began to fight to get my soul and my life back. My wife, for some reason, after all the horrible things I had said and done to her, still loved me. We began to talk again and spent some time together. I was having more and more feelings come back into my life and for once, I didn’t hate it. I felt happiness and joy, and I liked it. The only way my wife would agree to work things out was if I quit my EMS job. It was the reason my downward spiral started 15 years ago and I finally realized it. All the pain, suffering, death, abuse, drug use, and everything else slowly added up. The price of saving those lives at the beginning was my soul. The price was far too high. All it would have taken was for me to realize the problem on my own, or listen to my wife and talk to someone. Had I done this, my life would be totally different. I wouldn’t have nearly lost my job and a loving wife. You don’t have to sell your soul to make it in EMS. Employers offer services to help you get someone to talk to. Just because you didn’t have a MCI with hundreds of victims doesn’t mean you won’t suffer. Don’t lose yourself for the job like I almost did. In closing, I totally understand if this is not published. I’m glad to say that I came out on the other side a better person and husband. The contagious anonymous writer has requested that we place the link below, to counseling, for people suffering effects of PTSD from working in EMS. The writer believes it would be a great help because they are afraid that there are still far too many people in EMS afraid to seek help due to the stigma that one is weak if you can’t handle it. Need help or know someone that does?